At first, many in the audience might have thought it was part of the show. The famed actor had leapt onto the Ford’s Theater stage, shouted a line and then disappeared backstage. Some audience members must have tried to figure out what the line had been, while others wondered if John Wilkes Booth’s sudden appearance had been a surprise cameo in the evening’s play. But a split second later, Mary Lincoln’s scream from the box overlooking the Ford’s Theater stage made clear that this was not part of the show. Instead, it was an unspeakable crime which would devastate a nation that had just begun to rediscover some happiness at the end of four years of civil war. For Mary Lincoln it was a deep personal tragedy which she would mourn every day for the rest of her life. Just a moment earlier, the First Lady had been holding her husband’s hand, enjoying the play. She had whispered to him, wondering what the other guests in the box would think of her holding onto him the way she was. Mr. Lincoln had smiled and reassured her that they would not think anything of it. Then the assassin had struck. 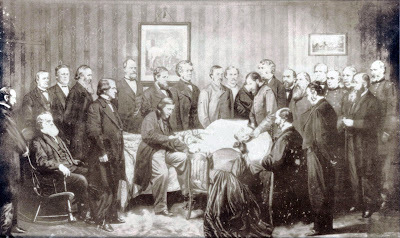 As President Lincoln was carried across the street to the Peterson House, the First Lady stayed at his side, pleading with him to open his eyes. She called for her youngest surviving son, Tad, thinking that his presence might rally his father to awaken. Finally, she had to be removed from the room. Her husband never regained consciousness, and she returned to his side just minutes before he died at 7:22 a.m. the next day, April 15, 1865. For Mary Lincoln, it was the latest heartbreak in a tragic life. 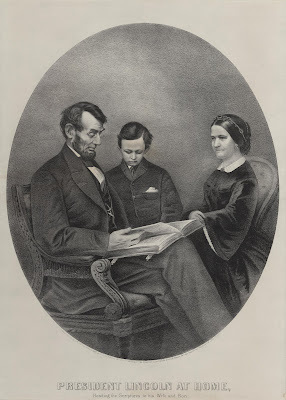 The funeral train would leave Washington in a few days, with the mourning Mary Lincoln accompanying not just the body of the murdered President, but also that of her son Willie, who had died of typhoid fever in the White House three years earlier. It was carrying Mary Lincoln away from a city where she had borne the slings and arrows of elitists who looked down on her and her husband as uncouth westerners, and who questioned her patriotism because of Kentucky relatives who had fought for the south in the war. Mary Todd was born in Kentucky in 1818, to a well-to-do, slave-owning family. She attended a finishing school, where she learned to speak French and studied the arts. 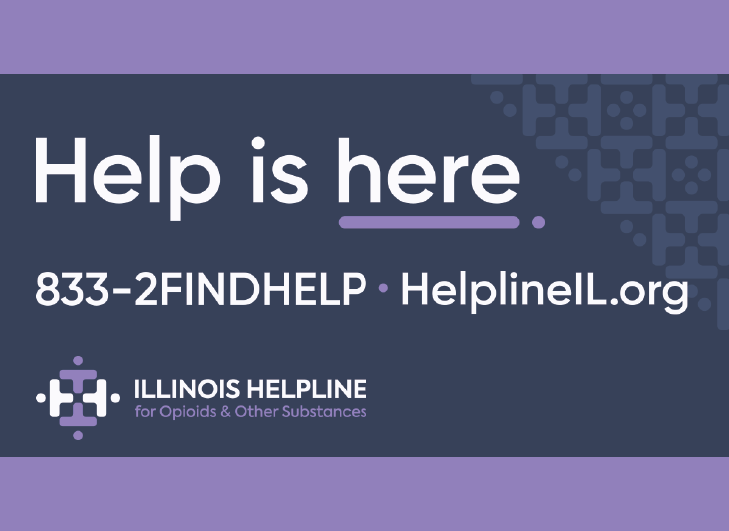 At 20 she moved to Springfield, Illinois, to live with her sister, Elizabeth, who was married to the son of former Illinois Governor Ninian Edwards. 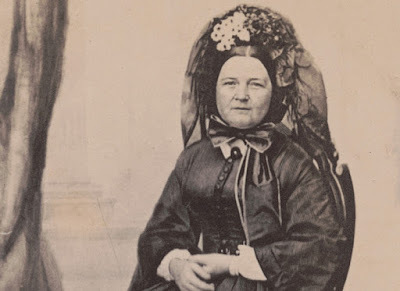 Three years later, Mary Todd married a local lawyer, Abraham Lincoln, but not before being courted by another rising political star in the new capital city, Stephen Douglas. The Lincolns’ first son Robert; named for Mary’s father; was born in 1844. That year they moved into the only home they ever owned, a house at 8thand Jackson Streets in Springfield. Eddie arrived two years later, then Willie in 1850 and Thomas (Tad) in 1853. But tragedy had already struck the family by then, as Eddie died of tuberculosis in 1850. When Abraham was elected President in 1860, Mary was snubbed and mocked by Washington society. Her half-brothers’ service in the Confederate Army made things worse. Critics attacked her attire and her lavish spending on White House receptions and renovations. Newspapers and gossips sensationalized her everyday activities and difficulties. After Willie’s death, she was said to have consulted a spiritualist to try to communicate with him. She dealt with severe headaches and also battled depression during her years in Washington. Modern-day historians and physicians have tried to diagnose her conditions, coming up with everything from a form of anemia to bipolar disorder to nothing more than what today would be considered an eccentric personality. Even now, after the death of her husband, Victorian-age Washingtonians criticized her in her grief, arguing that it was unseemly to mourn so publicly. The new President, Andrew Johnson, showed her no sympathy, so she retaliated by delaying her move out of the White House. would have been too much for many people, no matter what their physical condition. She eventually settled not in the old home in Springfield, but in Chicago, and determined to wear only black for the rest of her life. She received the remainder of her husband’s Presidential salary, and his valuable estate upon his death. In July 1870, Congress approved legislation, “to place the name of Mary Lincoln, widow of Abraham Lincoln, deceased, late President of the United States, on the pension roll, and allow and pay her a pension at the rate of three thousand dollars per annum from and after the passage of this act.” Yet she obsessed about money and seemed to have convinced herself that she was in fact impoverished. Then disaster struck again. In 1871, Tad Lincoln became ill and died of causes still uncertain. The overwhelming grief came crashing in yet again. Having now lost three sons and her husband, she obsessively worried about her lone surviving son, Robert. She went so far as to rush back to Illinois from a trip to Florida after becoming convinced that Robert was dying. He wasn’t. Stranger stories came to light. Her doctor reported that she had complained about bones being removed from her face and wires being pulled out of her eyes. She told Robert someone had tried to poison her on the train from Florida. Robert had detectives follow her, partly to observe and partly to protect her. “Six physicians in council informed me that by longer delay I was making myself morally responsible for some very probable tragedy, which might occur at any moment,” Robert wrote to a friend. Having his mother confined to an institution seemed the only option, but the only way to take that step was with a court proceeding. In May 1875; ten years since her husband’s funeral; Robert petitioned a court to have his mother institutionalized. Her defense attorney, Isaac Arnold, did not call any witnesses on her behalf. “She has been of unsound mind since the death of father; has been irresponsible for the past ten years,” Robert said at the trial, where a total of 17 witnesses testified to her infirmity. So deeply depressed was she when the jury found in his favor that she attempted suicide, but was thwarted. 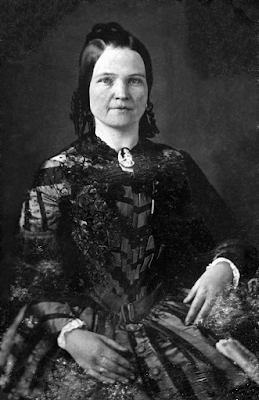 Committed to an asylum in Batavia, Mary Lincoln continued to fight the charges against her. In a series of letters she raised doubts about the circumstances of her institutionalization and hinted that Robert was only after her money. Her friends James and Myra Bradwell helped carry the banner of her cause, writing letters to other interested parties to come to Mary’s defense. Robert, meanwhile, believed his mother was in good hands, and possibly improving. “My mother is, I think, under as good care and as happily situated as is possible under the circumstances,” he wrote. The whole affair made it into the newspapers and caused enough embarrassment for Robert and others that she was released in September 1875 to the care of her sister Elizabeth back in Springfield. She continued to be estranged from her only surviving son for years thereafter. The debate over whether or not Mary Lincoln was truly insane has never been put to rest, and historians continue to discuss it today. “She got an utterly raw deal,” said her 2008 biographer Jean Harvey Baker. Fearing another attempt to confine her to an institution, Mary traveled to Europe, living in France for about four years. She remained grateful to the Bradwells for their work on her behalf. “When all others, among they my husband’s supposed friends, failed me in the most bitter hours of my life, these loyal hearts, Myra and James Bradwell, came to my assistance and rescued me under great difficulty from confinement in an insane asylum,” she wrote. She returned to America in 1880 as her health continued to decline. Back once again with her sister Elizabeth, she is said to have always left room on one side of the bed for her late husband. She died of a stroke on July 16, 1882. Robert; who was then serving as Secretary of War under President Chester A. Arthur; would, upon his death in 1926, be buried in Arlington National Cemetery. The former First Lady was interred in the Lincoln tomb alongside her three youngest sons and her late, deeply mourned husband, reunited at last.